Runs a process in background. routine The routine to be executed by the process created by JOB. routine-params Optional  A comma-separated list of parameters to pass to the routine. These parameters can be values, expressions, or existing local variable names. If specified, the enclosing parentheses are required. Routine parameters can only be passed to local jobs. The class method to be executed by the process created by JOB. The className cannot be $SYSTEM; it can be %SYSTEM. If you specify .. in place of className, JOB uses the current class context (the $THIS class). A comma-separated list of args arguments is optional; the enclosing parentheses are required. Omitted arguments are not permitted. For further details on using $CLASSMETHOD, refer to the section Dynamically Accessing Objects in the “Object-specific ObjectScript Features” chapter of Defining and Using Classes. process-params Optional  A colon-separated list of positional parameters used to set various elements in the job’s environment. The process-params list is enclosed in parentheses and the parenthesized list preceded by a colon. All process-params are optional; the parentheses are required. To indicate a positional parameter is missing, its colon must be present, though trailing colons may be omitted. The process-params argument can only be specified for local jobs. timeout Optional  The number of seconds to wait for the jobbed process to start. Fractional seconds are truncated to the integer portion. The preceding colon is required. The timeout argument can only be specified for local jobs. If omitted, InterSystems IRIS waits indefinitely. Optional  An explicit or implied namespace used to specify the system and directory on which to run a local or remote job. An implied namespace is a directory path preceded by two caret characters: "^^dir". Enclose joblocation in either square brackets or vertical bars. You cannot specify a joblocation when jobbing a class method. If joblocation specifies a remote system, you cannot specify routine-params, process-params, or timeout. If joblocation specifies a local job, you cannot specify the first process parameter (nspace) because this would conflict with the joblocation parameter. Therefore, only the second, third, and fourth process parameters can be specified, and the missing nspace parameter must be indicated by a colon. JOB creates a separate process known as a job, jobbed process, or background job. The created process runs in the background, independently of the current process, usually without user interaction. A jobbed process inherits its configuration environment from the invoking process, except what is explicitly specified in the JOB command. For example, a jobbed process inherits the locale settings of the parent process, not the system default locale. By contrast, a routine invoked with the DO command runs in the foreground as part of the current process. JOB can create a local process on your local system, or it can invoke the creation of a remote process on another system. For more on remote jobs, see Remote Jobs. When a job begins, InterSystems IRIS can call a user-written JOB^%ZSTART routine. When a job ends, InterSystems IRIS can call a user-written JOB^%ZSTOP routine. These entry points can be used for maintaining a log of job activity and troubleshooting problems encountered. For further details, see the section on “Using the InterSystems IRIS ^%ZSTART and ^%ZSTOP Routines” in Specialized System Tools and Utilities. An optional postconditional expression. InterSystems IRIS executes JOB if the postconditional expression is true (evaluates to a nonzero numeric value). InterSystems IRIS does not execute the command if the postconditional expression is false (evaluates to zero). For further details, refer to Command Postconditional Expressions in Using ObjectScript. label Specifies a line label within the current routine. ^routine Specifies a routine that resides on disk. InterSystems IRIS loads the routine from disk and starts execution at the first line of executable code within the routine. label^routine Specifies a line label within the named routine, which resides on disk. InterSystems IRIS loads the routine from disk and starts execution at the indicated label. Specifies an offset of a specified number of lines from the line label. Use of offsets can cause problems with program maintenance, and is discouraged. You cannot specify an offset when calling a IRISSYS % routine. If you attempt to do so, InterSystems IRIS issues a <NOLINE> error. If you are within a procedure block, calling the JOB command starts a child process that is outside the scope of the procedure block. It therefore cannot resolve a label reference within the procedure block. Therefore, for the JOB to reference a label within a procedure, the procedure cannot use a procedure block. If you specify a nonexistent label, InterSystems IRIS issues a <NOLINE> error. If you specify a nonexistent routine, InterSystems IRIS issues a <NOROUTINE> error. For further details on these errors, refer to the $ZERROR special variable. A comma-separated list of values, expressions, or existing local variable names. The enclosing parentheses are required. This list is known as the actual parameter list. The routine must have a formal parameter list with the same or a greater number of parameters. If you specify extra actual parameters, InterSystems IRIS issues a <PARAMETER> error. Note that if the invoked routine contains a formal parameter list, you must specify the enclosing parentheses, even if you do not pass any parameters. You cannot omit items from the list of routine-params. You can pass routine parameters only by value, which means that you cannot pass arrays. This is different from the DO command where you can pass parameters by value and by reference. A special consequence of this restriction is you cannot pass arrays with the JOB command, since they are passed only by reference. You cannot pass an object reference (oref) to a jobbed process. This is because a reference to an object existing in the invoking process context cannot be referenced in the new jobbed process context. Attempting to pass an oref results in passing an empty string ("") to the jobbed process. When the routine starts, InterSystems IRIS evaluates any expressions and maps the value of each parameter in the actual list, by position, to the corresponding variable in the formal list. If there are more variables in the formal list than there are parameters in the actual list, InterSystems IRIS leaves the extra variables undefined. Routine parameters can only be passed to local processes. You cannot specify routine parameters when creating a remote job. See Remote Jobs. Since the parameters are positional, you must specify them in the order shown. If you omit a parameter that precedes a specified parameter, you must include a colon as a placeholder for it. Process parameters cannot be specified for a remote job. nspace The default namespace of the process. The specified routine is drawn from this namespace. If you omit nspace, your current default namespace is the default namespace of the jobbing process. An invalid namespace may prevent the job from starting. A local job cannot specify both the joblocation argument and namespace as a process parameter; you must omit the nspace process parameter, retaining the placeholder colon. 1  Pass the symbol table to the spawned job. 2  Do not use a JOB Server. 8  Establish the process-specific window for two-digit years of the spawned job to be the system-wide default sliding window definition. Otherwise, the spawned job inherits the sliding window definition of the process issuing the JOB command. 16  Pass an open TCP/IP socket to the spawned job using current I/O device ($IO). 128 through 16384 (in multiples of 32)  An additional integer value that specifies a partition size (in kilobytes) for the JOBbed child process. See "Specifying Child Process Partition Size for more information. The switch value can be the sum of any combination of these integers. For example, a switch value of 13 (1+4+8) passes the symbol table (1), passes the open TCP/IP socket (4), and establishes a process-specific window for two-digit years that is the system-wide default (8). Blocking switches can be determined using the CheckSwitch() method of the %SYSTEM.Util class. Principal input device for the process. UNIX®: See principal-output for default. Principal output device for the process. The default is the device you specify for principal-input. UNIX®: If you do not specify either device, the process uses the default principal device for processes started with the JOB command, which is /dev/null. priority UNIX®  An integer that specifies the priority for the child process (subject to operating system constraints). If not specified, the child process takes the parent process' base priority plus the system-defined job priority modifier. You can use the $VIEW function to determine the current priority of a job. Windows has a Normal priority of 7. UNIX® priority ranges between -20 and 20, with 0 as Normal priority. In UNIX®, a process cannot give itself an increased priority unless running as root. os-directory An operating system working directory for file I/O. The default is to use the working directory inherited from the parent process. This parameter may be ignored on some systems. The use of switch=4 is discouraged, because this establishes the passed TCP device as the principal device of the child job. In this case, the child job could halt when it detected the TCP remote connection dropped and would not perform error trapping. Instead, users should use switch=16, and then in the child job use the %SYSTEM.INetInfo.TCPName() method to get the passed TCP device name. In this case, the child job could continue to run when it detected the TCP remote connection dropped, because the principal device of the child job is not the passed TCP device. The number of seconds to wait for the jobbed process to start before timing out and aborting the job. The preceding colon is required. You must specify timeout as an integer value or expression. If a jobbed process times out, InterSystems IRIS aborts the process and sets the $TEST special variable to 0 (FALSE). Execution then proceeds to the next command in the calling routine; no error message is issued. If a jobbed process succeeds, InterSystems IRIS sets $TEST to 1 (TRUE). Note that $TEST can also be set by the user, or by a LOCK, OPEN, or READ timeout. Timeout can only be specified for a local process. The following example starts the monitor routine in the background. If the process does not start in 20 seconds, InterSystems IRIS sets $TEST to FALSE (0). The following example starts execution of the monitor routine at the line label named Disp. The following example starts the Add routine, passing it the value in variable num1, the value 8, and the value resulting from the expression a+2. The Add routine must contain a formal parameter list that includes at least three parameters. The following example starts the Add routine, which has a formal parameter list, but passes no parameters. In this case, the Add routine must include code to assign default values to its formal parameters, since they receive no values from the calling routine. The following example creates a process running your current routine at label AA. The process parameters pass your current symbol table to the routine. It can use a JOB Server. This following example passes the routine parameters VAL1 and the string "DR." to the routine ^PROG, starting at entry point ABC, in the current namespace. The routine expects two arguments. InterSystems IRIS does not pass the current symbol table to this job, it will use a JOB Server if possible, and use tta5: as principal input and output device. The following examples show the jobbing of a class method, with a timeout of ten seconds. They use tta5: as principal input and output device. $CLASSMETHOD parameters must be passed by value, not by reference, when using JOB $CLASSMETHOD. For further details, refer to “Object-specific ObjectScript Features” in Defining and Using Classes. After you start a jobbed process, InterSystems IRIS allocates a separate memory partition for it and assigns it a unique job number (also referred to as a Process ID or PID). The job number is stored in the $JOB special variable. The status of the job (including whether or not it was started by a JOB command) is stored in the $ZJOB special variable. Since jobbed processes have separate memory partitions, they do not share a common local variable environment with the process that created them or with each other. When you start a jobbed process, you can use parameter passing (routine-params) to pass values from the current process to the jobbed process. There are no free partitions. There is not enough memory to create a partition with the characteristics specified by process-params. Processes created by the JOB command run as the InterSystems service account user. This means that you must insure that the InterSystems service account has explicit permissions to access all necessary resources. On Windows platforms, the job process uses the userid established for the InterSystems IRIS instance. On UNIX® platforms, the job process uses the userid of the process that issued the JOB command. Thus, when you spawn a job, you must make sure that the userid for the job process has the necessary permissions to use any files read or written during the job execution. Parameter passing by value can occur in only one direction and only at job start up. For processes to communicate with each other, they must use mutually agreed upon global variables. Such variables are commonly known as scratch globals because their sole purpose is to allow processes to exchange information among themselves. Processes can use the %SYSTEM.Event class methods to communicate between jobs. You can pass all local variables in the current process to the invoked process by specifying a special process parameter. Processes can communicate between jobs through the IPC (Interprocess Communication) devices (device numbers 224 through 255) or, on UNIX® operating systems, through UNIX® pipes. InterSystems IRIS assumes that the invoked routine includes code (that is, OPEN and USE commands) to handle device ownership for the new process. The default device is the null device. InterSystems IRIS does not assign a default device to any process other than the process started at sign in. The %PRIO utility allows you to control the priority at which a UNIX® jobbed process runs. The available options are NORMAL (uses load balancing to adjust CPU usage), LOW, and HIGH. A jobbed process with a priority of HIGH competes on an equal basis with interactive processes for CPU resources. InterSystems IRIS also allows you to establish default priorities for jobbed processes. You can use the BatchFlag() method to establish a process as executing in batch mode. A batch mode process has a lower priority than a non-batch process. Issue the JOB command while in the raw partition. Issue the JOB command while in another namespace, and specify the raw partition as the nspace process parameter of the JOB command. Here nspace is an implied namespace. An implied namespace is a directory path preceded by two caret characters: "^^dir". Implied namespace syntax is described in Global Structure in Using Globals. Commands and jobbed processes running in a raw partition must always specify the full pathname when making references to filenames, and must not use any pathname that starts with "." or ".." , as these are special UNIX® files and are not present in a raw partition. Violating either of these rules causes a <DIRECTORY> error. Alternatively, you can use UNIX® job-control syntax (&) instead of the ObjectScript JOB command. Before starting a remote job, you must establish an ECP connection and set the netjob parameter to true. This enables the server to handle job requests from remote ECP client systems. You must configure the ability to receive remote job requests on any system that will receive them. On the receiving system, go to the Management Portal, select System Administration, Configuration, Additional Settings, Advanced Memory. Locate netjob to view and edit. When “true”, incoming remote job requests via ECP will be honored on this server. The default is “true”. The license on the remote system must support enough users to run remotely initiated jobs. You can determine the number of available InterSystems IRIS licenses using class methods of the %SYSTEM.License class, as described in the InterSystems Class Reference. The two forms are equivalent; you can use either square brackets or vertical bars to enclose the joblocation parameter. A remote job cannot pass routine parameters, process parameters, or a timeout. joblocation A specification of the location of the job. The enclosing square brackets or vertical bars are required. The action InterSystems IRIS takes depends on the job location syntax you are using. ["namespace"] InterSystems IRIS checks whether this explicit namespace has its default dataset on the local system or on a remote system. If the default dataset is on the local system, the system starts the job using the parameters you specify. If the default dataset is on a remote system, the system starts the remote job in the directory of the namespace’s default dataset. ["dir","sys"] InterSystems IRIS converts this location to the implied namespace form ["^sys^dir"]. ["^sys^dir"] The job runs in the specified directory on the specified remote system. InterSystems IRIS does not allow any routine parameters, process parameters, or timeout specification. ["^^dir"] The job runs in the specified directory (implied namespace) as a local job on the current system using the parameters you specify. An implied namespace is a directory path preceded by two caret characters: "^^dir". ["dir",""] InterSystems IRIS issues a <COMMAND> error. InterSystems IRIS does not provide global mapping for remote jobs, whether or not global mapping has been defined on the requesting system. To avoid the lack of global mapping, use extended references with your global specifications that point to the location of any globals not in that namespace. If the namespace you specify in an extended reference is not defined on the system you specify, you receive a <NAMESPACE> error. Namespaces and the syntax for extended global references are described in Global Structure in Using Globals. $ZPARENT contains the PID (Process ID) of the process which jobbed the current process, or 0 if the current process was not created through the JOB command. $ZCHILD contains the PID of the last process created by the JOB command, whether or not the attempt was successful. By using $ZCHILD it is possible to determine the execution status of a remote job by comparing the $ZCHILD value before and after running the JOB command. If the before and after values are different, and the after value is nonzero, the after $ZCHILD value is the PID of the newly created remote job, indicating that the process was successfully created. If the after value is zero, or the after value is the same as the before value, the remote job was not created. $ZCHILD can only tell you that a remote job was created; it does not tell you if the remote job ran successfully. The best way to determine if a remote process ran without error and ran to completion is to provide some sort of logging and error trapping in the code being run. The remote job mechanism does not inform the parent process in any way about remote process errors or remote process termination, successful or otherwise. JOB Servers are InterSystems IRIS processes that wait to process job requests. Jobbed processes that attach to JOB Servers avoid the added overhead of having to create a new process. Whenever a user issues a JOB command with the switch parameter set to use JOB Server if available, InterSystems IRIS checks to see if any JOB Servers are available to handle it. If not, it will create a process. If there is a free JOB Server, the job attaches to that JOB Server. When a job halts while running in a JOB Server, the JOB Server hibernates until it receives another job request. A jobbed process not running in a JOB Server exits and the process is deleted. There are some unavoidable differences between the JOB Server environment and the jobbed process environment, which may be a security concern with jobbed processes executing in JOB Servers. A jobbed process takes on the security attributes of the process that issued the JOB command at the InterSystems IRIS level. Only one process can own a device at a time. This means that a job executing in a JOB Server is unable to perform input or output to your principal I/O devices even though you may close device 0. Failure to follow these guidelines may cause the job executing in the JOB Server to hang if it needs to do any input or output from/to your principal I/O devices. You may find that frequently job output does get through to your terminal (for example, if you have the SHARE privilege), but typically it will not. If your job does not start, check your I/O specification. Your job will not start if InterSystems IRIS cannot open the devices you requested. Note that the null device (/dev/null on UNIX®) is always available. If your job starts but then halts immediately, make sure you have sufficient swap space. Your job receives an error if you do not have enough swap space. If the new process created by a JOB command halted immediately or was terminated by the ^RESJOB utility before the process startup was complete, the JOB command generates a <HALTED> or <RESJOB> error. Refer to the HALT command for further details. Execute the routine with the DO command. Make sure you are not exceeding the number of processes for which you are licensed in InterSystems IRIS. You can determine the number of available InterSystems IRIS licenses using class methods of the %SYSTEM.License class, as described in the InterSystems Class Reference. If there is a timeout parameter in your JOB command, check whether the speed of your system is using up the timeout period. When many jobs are executing concurrently, the JOB command may hang while waiting for a routine buffer or a license slot. You can interrupt a JOB command by using Ctrl-C.
A jobbed process continues to completion even if the process that created it logs off before that completion. You can use the JOB command to implement a TCP concurrent server. 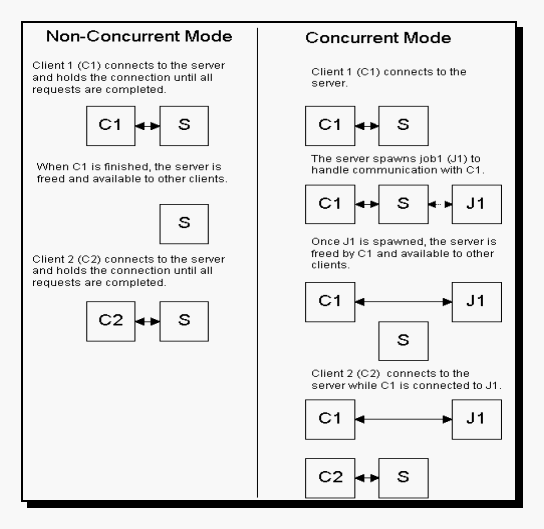 A TCP concurrent server allows multiple clients to be served simultaneously. In this mode a client does not have to wait for the server to finish serving other clients. Instead, each time a client requests the server, it spawns a separate subjob for that client which remains open as long as the client needs it. As soon as this subjob has been spawned (indicated by the return of the JOB command), another client may request service and the server will create a subjob for that client as well. A concurrent server uses the JOB command with the switch process parameter bit mask bit 4 or bit 16 turned on, and passes to the spawned process the input and output process parameters. It is important to note that the JOB command will pass the TCP socket to the jobbed process if the 4 or 16 bit is set. This capability may be combined with other features of the JOB command by adding the appropriate bit code for each additional feature. For example, when switch includes the bit with value 1, the symbol table is passed. To turn on concurrency and pass the symbol table, switch would have a value of 5 (4+1) or 17 (16+1). After the JOB command, the device in the spawning process is still listening on the TCP port, but no longer has an active connection. The application should check the $ZA special variable after issuing the JOB command to make sure that the CONNECTED bit in the state of the TCP device was reset. The spawned process starts at the designated entry point using the specified device(s) as TCP device, principalinput, and principaloutput device. The TCP device has the same name in the child process as in the parent process. The TCP device has one attached socket. The USE command is used to establish the TCP device in “M” mode, which is equivalent to “PSTE”. The “P” (pad) option is needed to pad output with record terminator characters. When this mode is set, WRITE ! sends LF (line feed) and WRITE # sends FF (form feed), in addition to flushing the write buffer. The TCP device in the spawned process is in a connected state: the same state the device would receive after it is opened from a client. The spawned process can use the TCP device with an explicit USE statement. It can also use the TCP device implicitly. WRITE !,"Cannot open server port"
USE 0  WRITE !,"Accepted connection"
WRITE !,"No message from child"
The child uses the inherited TCP connection to pass its job ID (in this case assumed to be 3 characters) back to the client, after which the child process exits. The client opens up a connection with the server and reads the child’s job ID on the open connection. In this example, the IPv4 value "127.0.0.1" for the variable "host" indicates a loopback connection to the local host machine (the corresponding IPv6 loopback value is "0:0:0:0:0:0:0:1" or "::1"). You can set up a client on a different machine from the server if "host" is set to the server’s IP address or name. Further details on IPv4 and IPv6 formats can be found in the section “Use of IPv6 Addressing” in the chapter “Server Configuration Options” in the Orientation Guide for Server-Side Programming. In principle, the child and client can conduct extended communication, and multiple clients can be talking concurrently with their respective children of the server. If job servers are active, for any job server process the job partition size will always be 262144 (in kilobytes). If job servers are inactive, the job partition size defaults to the default partition size for non-background jobs (bbsiz). This is the system-wide default in effect when you execute JOB, regardless of the partition size of the parent process from which you issue JOB. If job servers are enabled, but all of them are active and you start a new job, that job process will not be a job server process, so its $ZSTORAGE value will default to bbsiz. This is also true when job servers are active, but due to loading the job is run in a non-job-server process. If job servers are inactive, you can specify the partition size of the jobbed child process in the JOB statement. You specify the partition size (in kilobytes) of the jobbed process in the second process parameter of the JOB command. For example, JOB ^myroutine:(:8192). The value you specify must be a multiple of 32 and must range from 128 through 16384. It also cannot exceed the default partition size; it can only be used to specify a lower value than the default. You can optionally specify the partition-size process parameter value in combination with other process information that you would normally put in the second process parameter of JOB. Consider the following JOB command: JOB ^myroutine:(:544+1). This command specifies that the symbol table of the jobbing process should be passed to the jobbed process and that the jobbed process should have a partition size of 544K. Although you can specify this second parameter, which passes two values (544 and 1) as 545, 544 +1 is clearer and has exactly the same effect. Note that a job itself can programmatically set its own partition size using SET $ZSTORAGE.